While John Williams’ score for The Last Jedi draws heavily on his existing thematic material in the Star Wars saga, it does contain three new themes that feature prominently in the score, ones for Rose, Luke in exile, and desperation felt by the Resistance. This brief film music analysis discusses some of the musical meanings embedded in these themes. Of the three new themes, the most pervasive in the film is that for Rose, a new character who teams up with Finn in an adventure-filled subplot. The theme that Williams writes for her depicts several of her character’s traits. Perhaps the most immediately obvious feature of the theme is its distinctive opening progression on I–II#, which is drawn from the Lydian mode with its characteristic raised 4th scale degree. This progression is already a part of two prominent Star Wars themes: those for Yoda and the boy Anakin. What these characters have in common with Rose is a kind of purity and absence of corruption (a quality which of course contrasts with Anakin’s later behavior as a young man). In some statements of Rose’s theme, the II# chord is replaced with the regular II of the major mode. As a variant of the IV chord, this regular II is more associated with plagal progressions and the kind of placidity they express (as, for example, in so-called “Amen” cadences in music of the church). The melody of the theme is based entirely on repetitions and variations of first bar’s harmony and melodic motive, whose notes tend to fall on the main beats of the meter. Both of these features suggest a simplicity that highlights Rose’s youthful and almost child-like innocence. The melody also has a rising contour in several ways: 1) within each bar, 2) in its shifting up of the whole motive in the third bar, and 3) transposing the whole phrase up a third in the second phrase. This shifting up of the second phrase changes the key from Db major to F major, which lies four 5ths higher on the circle of 5ths and thus creates a “brighter” or more uplifting feeling. All of these upward motions along with the theme’s major/Lydian mode indicate something positive, which correlates well with Rose’s unwavering, and indeed “rosy”, optimism throughout the film. Luke is given a new theme for his self-imposed exile on the island of Ahch-To. Given that Luke is the hero of the original Star Wars trilogy, it is significant that this theme does not derive from or otherwise relate to either his own theme from those films (which is also the Star Wars main theme) or the Force theme, the two themes with which he was most associated. This is appropriate since Luke has evolved into quite a different character in this film and (for the most part) has even cut himself off from the Force. The new exile theme is very different in its construction. To begin with, it is set in triple time, not the march-like quadruple time of the old themes for Luke and the Force. Second, as triple times go, the tempo is moderately slow. And third, there is consistent emphasis on the second beat of the bar by placing the longest note of the motive there. These qualities all suggest the traditional baroque dance known as the sarabande, which projects a serious and stately quality that corresponds with Luke’s status as a living legend. The theme’s melody and harmony also suggest much of Luke’s emotional state. The trajectory of the theme’s melody is one that winds downward from scale degree 5 to the tonic 1, which, together with the theme’s minor key, implies a negative frame of mind. Compare this to the several large upward leaps in Luke’s old theme suggesting heroism, and the slowly rising line of the Force theme that suggests a gradually succeeding endeavor. The entire melody is based on a single motive, suggesting a kind of obsessive state that one is unable or unwilling to break out of. The harmony follows this idea as well as there is never any motion away from the bass line’s tonic pedal, a device that lends the theme a feeling of inertia, which mirrors Luke’s desire to be disengaged from the fighting and lead a solitary life on the island. Also notice that, in the first bar, the melody rises stepwise in the theme’s minor key from scale degree 5 to scale degree 6 and back again. This motion of 5-6-5 is one that has long been associated with expressions of deep sadness. Williams even emphasizes this feature by placing the 6th degree on the lengthened note on beat 2, and by sounding scale degree 5 at the same time as 6, producing a striking semitone dissonance that seems to cry out in pain. This same dissonance is also found in some statements of the Force theme in the film that accompany Luke as he continues to be in low spirits. Simple though this theme sounds, it paints quite a detailed and emotionally powerful picture of Luke in his exile on Ahch-To. The last new theme of the film appears when situations are the most desperate for the Resistance. Aside from the theme’s obvious minor key, this sense of desperation is expressed musically by preventing the listener from gaining a solid footing in several parameters. One of the theme’s most prominent features is its setting in a triple time, which is unusual given that most aggressive and militaristic-sounding themes like this are in a march-like quadruple time. From this perspective, the tone of the theme and its meter are at odds with one another, creating a kind of tension, almost as if each bar has had a beat go missing somewhere. This feeling is enhanced by the insertion of a bar of 4/4 time between each statement of the theme above, which literally juxtaposes the two meters for the listener. Another unusual aspect of this theme is that it does not hold firm to one particular motive as do the themes for Rose and Luke in Exile. By contrast, in the first statement shown above, each bar is rhythmically unique in the theme, and in subsequent statements, though the beginning loses its dotted rhythm and becomes rhythmically the same as the third bar, no bar’s rhythm is directly repeated. Nor is there any particular intervallic motive holding the whole theme together. Instead, although steps between notes predominate (as with most themes), it incorporates steps, small skips, and large leaps in an almost haphazard way, creating a musical equivalent to the act of flailing. Finally, there is the shifting of the entire theme upwards (by a third) each time it is restated. Whereas this same technique in Rose’s theme was a sign of her positive and uplifting attitude, here its grouping with the parameters above and brassy orchestration signify a negative situation that is becoming increasingly intense, or indeed desperate. 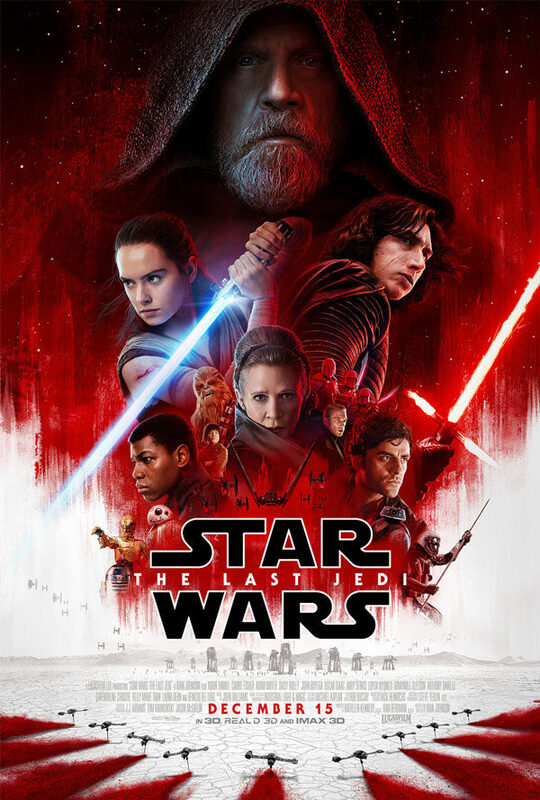 Having reached the eighth episode of the main Star Wars saga and writing for a sequel film rather than a prequel, Williams’ score for The Last Jedi draws on an extensive array of themes that first appeared in earlier installments. But even so, since each film inevitably brings new characters and new developments for established characters, there is always a need for new thematic material. And though he has trod the Star Wars path seven times before, he demonstrates that he is still able to forge themes in a way that is highly sensitive to the emotional content of the events onscreen. Both the “Luke in Exile” and “Desperation” labels are from Frank Lehman’s catalog of Star Wars themes. It is fascinating to trace the arc of the story & it’s characters in the music! It adds depth & understanding. Though I’m not a very schooled (as in Theory)musician (am a singer), I love to learn the ‘fabric’ of music. Thanks for this opportunity. Glad you found it useful, Claire. I always try to aim these posts so they can be for more than just specialists in composition or theory. Thanks for the comment! If you want, there are plenty of YouTubers who talk about music theory – 12tone, Adam Neely, 8-bit Music Theory, Rick Beato and Aimee Nolte, to name a few. I recommend you check them out. Hi, Mark, I am enjoying reading your comments and analysis of film music. I teach a unit called, “Music in the Movies” for my 5th graders and we’re in the middle of our discussion on leitmotif. Yes, I know, it’s pretty sophistocated stuff for 10-11 year olds, but they love the concept of telling the story of a character through music. I found your site when I was looking for more info on the Harry Potter (Hedwig’s) theme and want to thank you for your intelligent, succinct and enlightening viewpoints. Keep up the great work! Thanks very much, Teresa! I had no idea this material could be adapted for such young minds. Williams scores in particular are great for leitmotif, especially because they usually capture so perfectly what they are associated with on the screen. Best wishes for the movie music unit! This is a very interesting and enjoyable analysis! I’m wondering about another phrase that seems to be related to the Luke in Exile theme. It appears as a third element in the track “The Rebellion is Reborn”, along with Rose and Luke in Exile. It also appears in the track “Ahch-To Island”, and in the finale it “sandwiches” the Luke in Exile theme. Due to its placement it seems related to Luke in Exile, and to my ear it seems related in the progression of notes, but it’s a different time signature I think and it sounds more forceful. Would you consider it a sub-theme to Luke in Exile? Hi Matt – great question. I did not include that part of the theme because I’m aiming to keep posts on the shorter side. But it’s certainly part of the Luke in Exile theme and seems to act something like framing material for the more central sarabande-like portion I show in the post. But it is more connected to the main melody than simple introductory or bridging material since it is essentially a variation of the main melody, similarly winding its way down from scale degree 5 all the way to 1. And as you point out, the time signature has changed. So has the rhythm, which is rather disjunct, making it sound less melodic and therefore less significant than the sarabande melody. In short, we could probably say it’s somewhat analogous to B sections of other Williams themes. That is, its purpose seems to be to separate statements of the main material, and in this case, that’s especially important because the main melody here is built on successive statements of a single motive, which could easily become tiresome. Its status as a kind of variation of the main melody, though, is unusual for Williams but is another aspect that places the theme in line with sarabandes, which were often used as a theme for variation (well known examples being Bach’s Goldberg Variations and the Sarabande movement of Handel’s Keyboard Suite in D Minor). Thank you for sharing your work here. Similar to Theresa above, I am using it with a middle school student learning English who composes electronic pieces and posts on his website. My objective is for him to describe his own music. Your articles here are the only ones I have found online that has the approach and language we need. I am fascinated with the analysis and it is really helping my student express himself.